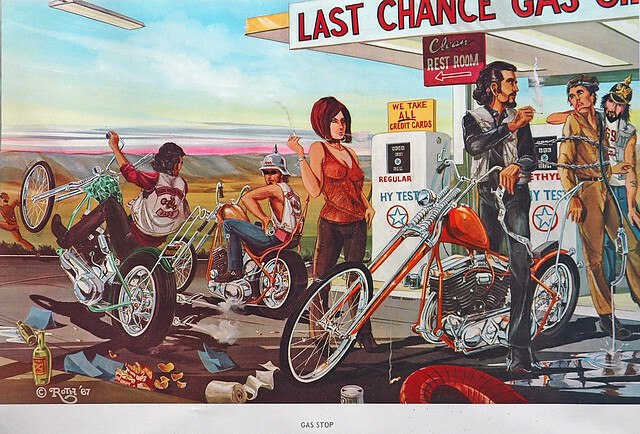 If there is such a genre as Biker Art then Dave Mann has to be the leader of the pack. 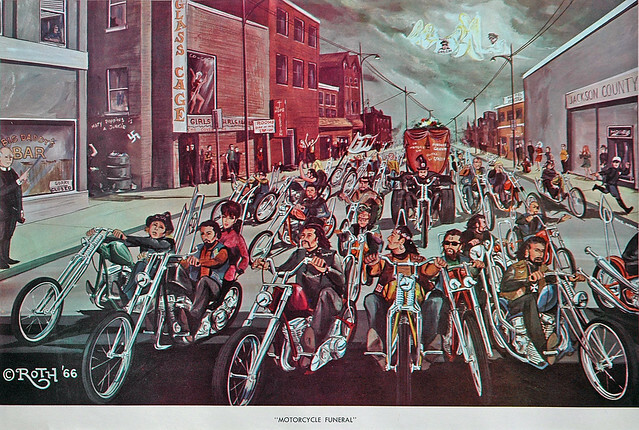 In fact a simple Google of ‘Biker Art’ brings up four of his paintings at the top of the page and five mentions of his name on the front page alone. 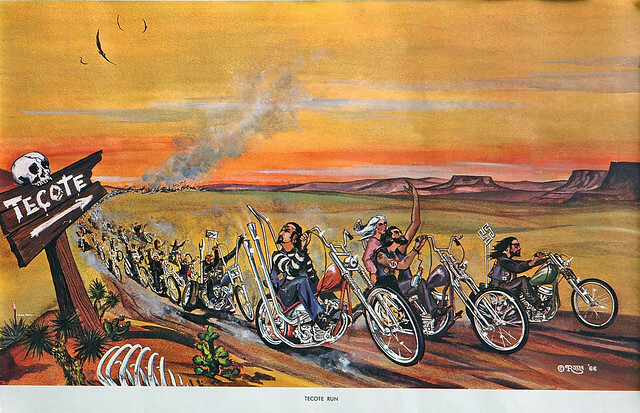 Here we take a brief look at the life and times of Dave Mann and we’ve also managed to uncover some of the early work that kickstarted his Biker Art career and first got his name in lights. Mann was born in Kansas in 1940 and as a boy showed an early aptitude for drawing and painting. 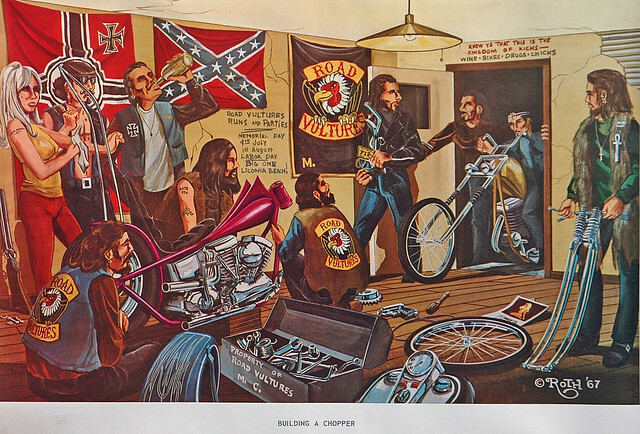 He initially trained as a car sprayer due to an interest in custom cars but following a move to California he became more and more interested in the nascent biker culture that was developing in the early 60s. 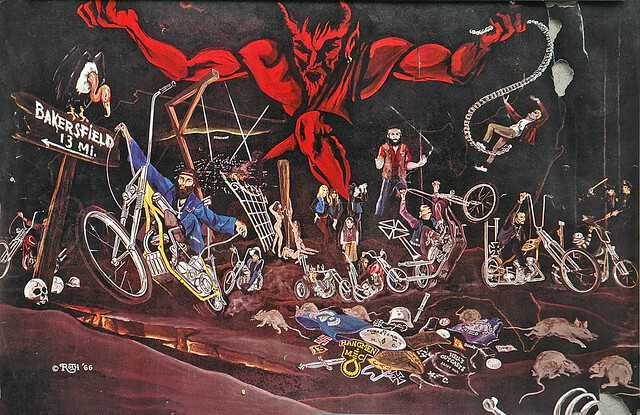 He started painting biker scenes and took some of his early work to the custom car show where it came to the attention of Ed ‘Big Daddy’ Roth the man credited with creating the first ever custom car who had also started creating his own personalised motorbikes. 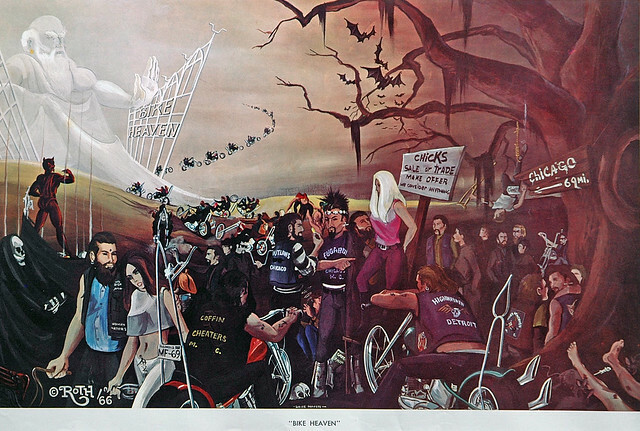 Roth was in the process of setting up ‘Choppers’ magazine because he could not get any of the mainstream publications to publish his articles on customised bikes and was very interested in Mann’s work.The original painting Mann first showed to Roth was ‘Hollywood Run’ and on the basis of this Mann was commissioned to produce a series of paintings. 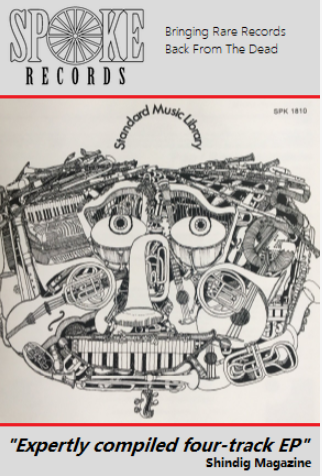 Quite how many is unclear but we have 17 of Mann’s early works here; whether they are all part of the Roth commission we do not know. 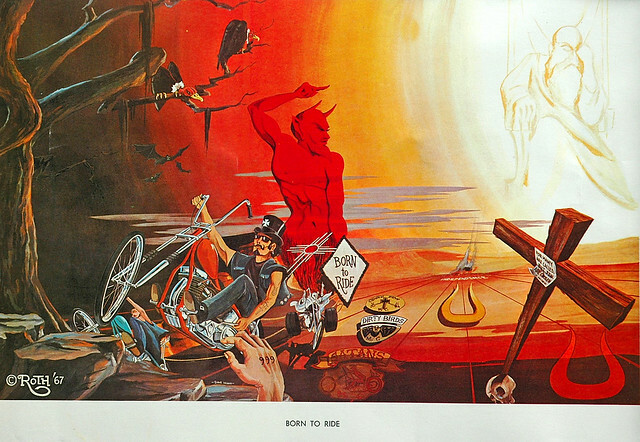 Whilst the copyright on the paintings is Roth’s they are all the work of Mann. 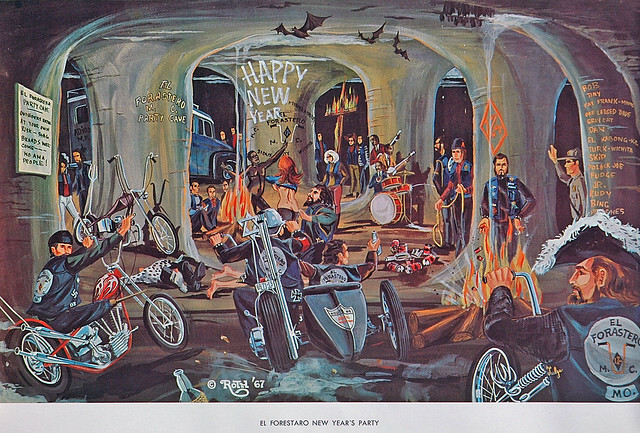 In 1965 Dave Mann joined the controversial El Forastero Motorcycle Club, a self-professed one percenter club. This is derived from an alleged comment by the American Motorcyclist Association in 1947 that 99% of bikers are law-abiding citizens thus leaving 1% who weren’t. 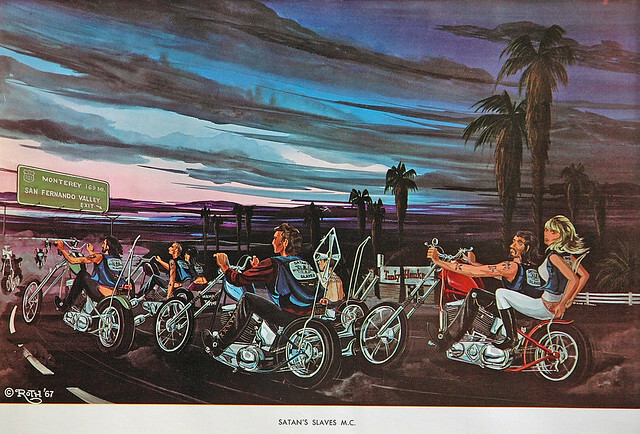 One percenters are generally considered to be outlaws and are grouped together as Outlaw Motorcycle Gangs (or OMG). 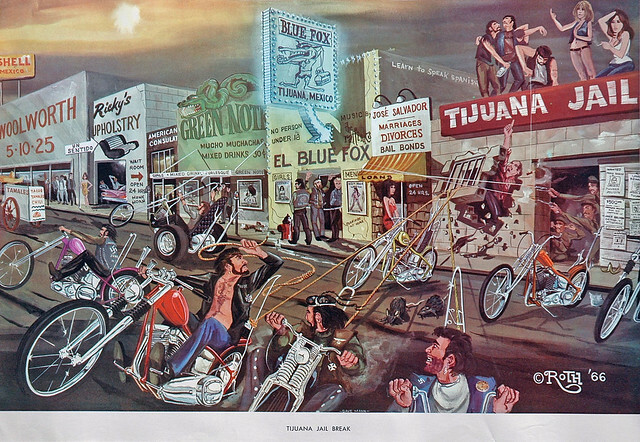 Members of the El Forastero would often appear in Mann’s work but the club is not controversial without reason and has been implicated in drug running and motorcycle theft on a significant scale. 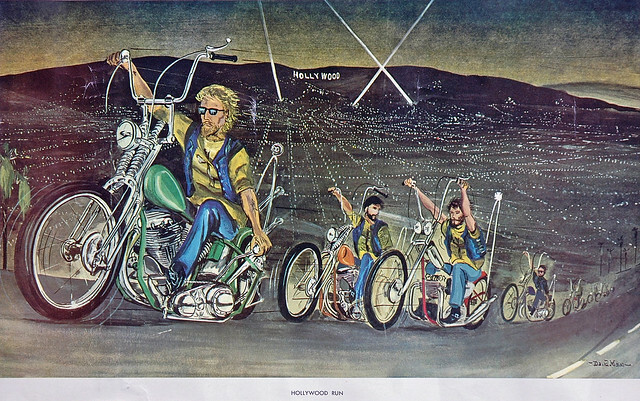 In 1972 having responded to an advert for a ‘motorcycle artist’ Mann’s work started appearing in the American ‘Easyriders’ publication where he became the centrespread artist and remained so for 30 years until ill-health forced his retirement in 2003. The following year, just one day after celebrating his 64th birthday Mann passed away. Just prior to his death Orange County Choppers had been commissioned to create a ‘David Mann Bike’ which went on to feature in the ‘American Chopper’ show. The episode in question was dedicated to Mann. 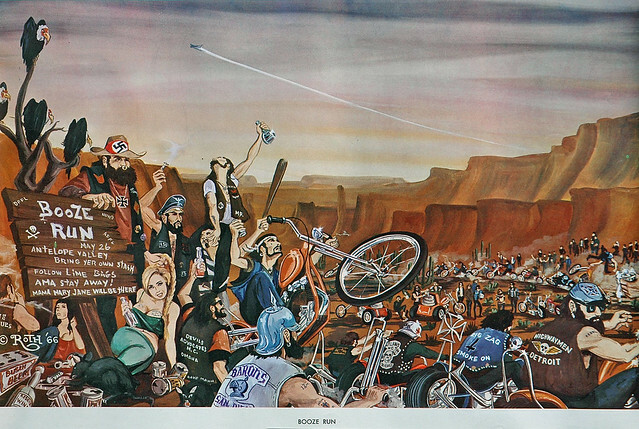 The posters we have here represent Mann’s very early work and were all painted in the mid-1960s before the film Easy Rider and the whole explosion in biker culture that followed. 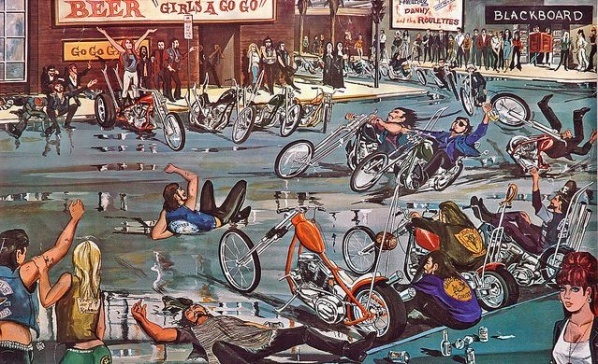 They depict the typical biker scene of the time which is not for the faint-hearted and in many ways objectifies women. 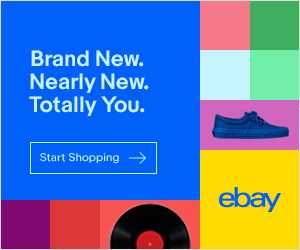 Clearly, being the open-minded and forward-thinking guys we are here at VoEA, we do not approve of such sexist notions and in no way condone such behaviour. 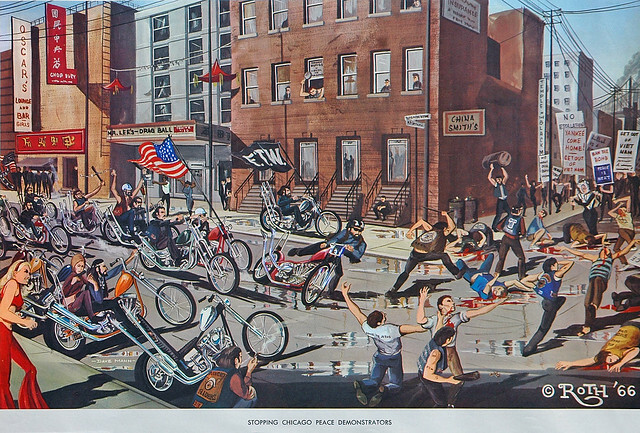 However, as a record of what was going on at the time through the eyes of Dave Mann these paintings are interesting and worth a look – whether the US Outlaw bike scene is still the same now we really don’t know but the odds are it’s not changed much in the last 50 years or so.